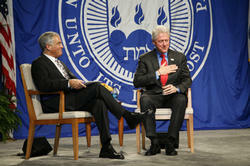 Former President Bill Clinton Charges Brandeis Crowd to Become "Social Entrepreneurs"
Former U.S. President Bill Clinton took time to honor the legacy of an old friend Monday at Brandeis University. The 42nd president was invited to give the inaugural lecture for the university’s Eli J. Segal Citizen Leadership Program. The Heller School's Development Office began working with Phyllis Segal ten months ago on planning and fundraising for this program, which consists of paid summer internships for Heller public policy students as well as Brandeis undergraduates. An annual lecture and a career network linking the interns and other Segal Fellows from the Corporation for National and Community Service, AmeriCorps and City Year form the core of the program, which is endowed in perpetuity. A $4 million goal was established, with $3.8 million raised by the December 3 program inauguration. The program will be managed by Tom Broussard, PhD '06, Assistant Dean for Recruitment, Admissions, and Career Services at the Heller School. Segal, a member of the Heller Board of Overseers, was Clinton’s chief of staff in his presidential campaign in 1992 and served as an assistant to the President in the White House, working on the administration’s AmeriCorps and Welfare-to-Work programs. In tune with Segal’s career, the program at Brandeis is designed to encourage new leaders to engage in a lifetime of citizen service and serve as a platform to promote community service and citizen leadership. Brandeis president Jehuda Reinharz, who introduced Clinton, also led a question and answer session after the lecture. For more information about the Eli J. Segal Citizen Leadership Program, email cjacobs@brandeis.edu or tbroussa@brandeis.edu.